It's official, My wife received orders to Ramstein Air Base Germany. I'll be joining her there sometime 4th quarter 2019 for 90 days at a time per visa requirements. I'm looking for any suggestions for aircraft wrecks, museums or just fun things to do in Germany. I have a suggestion or two for you, these are a couple of sites that I would like to visit if I ever made it over there. Dessau Germany was the site of a WWII Junkers plant. After the war it fell behind the iron curtain and became an East German air force base. It is now an air museum. The Junkers plant at Dessau was targeted by the 8th AF twice in 1944, once in the spring and again in August. The spring time raid tore up the airfield but didn't seem to harm the plant much (from what I can tell). The August raid was conducted by B-24s of the, 445th bomb group, 703rd squadron (Jimmy Stewart Commanding). The raid was on August 16th, and two B-24s were lost. One of the B-24s (42-51098) piloted by Lt. Joe Guastella was hit by flak and rolled over on to another B-24 (42-52447) in the lower formation. Both planes came down about 7 km north of Mosigkau Germany before reaching the target at Dessau. The pilot of a third aircraft immediately behind the collision reported that he flew through the debris and was forced downward losing more than 5,000 feet of altitude (if I recall correctly) and narrowly avoided joining the two lost planes. 17 of the 18 crew died in the immediate crash. One of the Pilots (Lt. Joe Guastella) survived for a couple days in a German hospital, but also died. The German recovery crew could not distinguish which remains. The aircraft were later released to a local scrapping operation. My moms cousin was the navigator on Lt Guastellas aircraft. His name was Norman A Harris, he was 22 years old and had flown 3 missions over Germany. The US Army recovered all of the remains from the German cemetery after the war, but Norman remained unidentified until 1956. 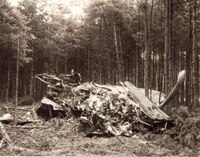 The Army went to great lengths to identify all the remains after the war, and even paid locals to go into East Germany to try and gather more information on the crash and disposition of remains. Ironically, from what I can tell, it seems the Junkers plant was idled at the time of the August 16 1944 raid - due to low demand for Stukas and Stuka engines. I have the MACR, the KU (German Crash report), and the IDPF (Individual Deceased Person File) for Norman. If you are interested, I would happily share all of the information I have on this incident. The MACR has a rough map showing where the collision took place. These are sites I would like to visit myself, but I don't see myself getting over there anytime soon. I meant to say... The German recovery crew could not distinguish which remains came from which aircraft. If you make it up to the NATO base at Geilenkirchen (near the border with The Netherlands), the crash site of Esso 77 (KC-135E, 59-1452, 13 Jan 1999) is off the west end of the runway near a road. In that same area are quite a few remnants of the Siegfried Line that are very interesting to see. From Ramstein, it's a short drive to Trier and ruins of structures built by the Romans. There's a very nice museum (predominately Messerschmidt, IIRC) at the Ingolstadt air base (near Munich). The problem with the European wrecks is they are 10 feet under ground. You need an excavator. If you are exploring Germany, I know this isn't anywhere near Ramstein, but I always wondered if anyone looked for these sites as it is a more remote area, not as developed. 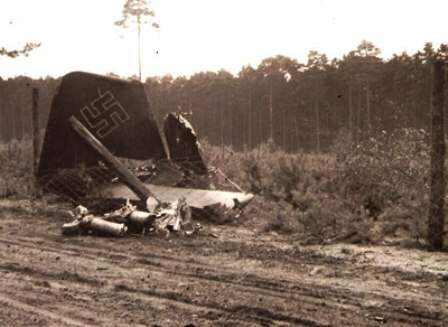 Thirteen Ju-87B Stukas of 76 Sturzkampfgeschwader crashed during a mass diving attack demonstration flight for senior Luftwaffe commanders in fog near Neuhammer, Germany (southeast of Berlin). This was just a few weeks before the invasion of Poland. They were the latest B-models, nearly twice as powerful as the ones used in Spain. It seems with 13 wreck sites that something would turn up.